Toxic Epidermal Necrolysis (TEN) is the life and health threatening and a kind of severe adverse drug reactions characterized as the epidermal detachment illustrating with areas of denuded skin and the blisters in the whole body. 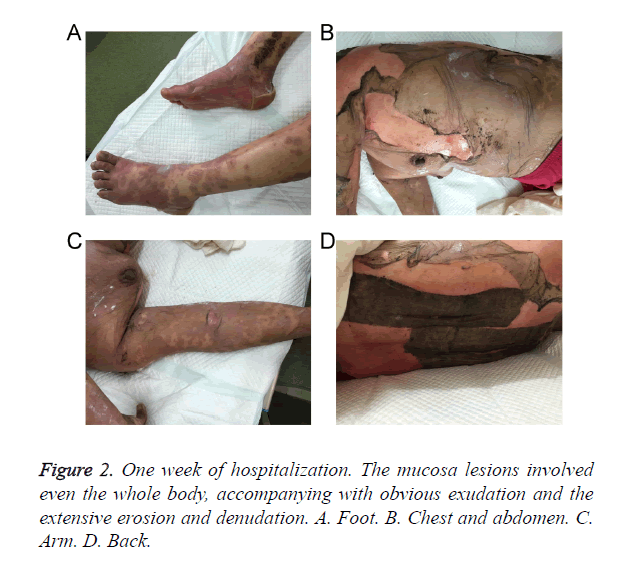 We reported a case of methazolamide-induced in a TEN in a 57-year-old Chinese Han woman who was admitted in the dermatology department with a rapid progressing of erythematous, blisters, red macular and papular lesions, and maculopapular rash all over the body. As the body epidermal detachment achieves to approximately 30% of the whole body, and developed severe bullous lesions epidermal detachment achieves to 80% of the body surface, combining with the positive allele HLA-B*5901 expression, she was diagnosed as the toxic epidermal necrolysis. The disease course was keep about 15 days after stopping the drug and starting a symptomatic therapy. The positively expressed HLA-B5901 serotype, combining with the initial clinical signs of fever, dysphagia or burning eyes and influenza-like lesions (prior to mucocutaneous lesions), could act as the prognostic biomarkers for the potential occurrence of TEN in Chinese Han population. Meanwhile, the early discover and stop using the suspected drug is also an important method to improve the prognosis of TEN. Toxic epidermal necrolysis, Methazolamide, HLA-B5901 serotype, Lesions. Toxic Epidermal Necrolysis (TEN) is a potentially fatal diseases, which characterizes as high fever, atypical target-like lesions, wide-spread blistering exanthema of macules, and also accompanying by the mucosal involvement [1,2]. The TEN always triggers the complications in many organs, including kidney, lung, liver, which distribution causes the difficulty for the treatment. The area of the epidermal detachment is widely and extensively in the TEN. Meanwhile, the TEN is the severe adverse drug reactions featured by a low incidence and a high mortality [3,4]. The incidence of TEN is approximately 2 patients per million people every year, 4 and with the mortality rate range from 30% to 40% . Till now, the effective therapy strategy for TEN has not been successfully established. In clinical, the TEN mainly treated by the supportive care, high-dose intravenous immunoglobulin, systemic corticosteroids and plasmapheresis, which were considered as the effective in the previous studies [6-8]. However, the application of the above treatment modalities is also controversial in some of the countries . This study mainly attempts to introduce the current clinical characteristics and therapy of TEN in China. In this study, we reported here the case of TEN due to the application of methazolamide. This study was approved by the ethics committee of Jiangyin hospital affiliated to Nanjing university of TCM. The patient gave the consents and approved this study. A case of 57-year-old Chinese Han woman who was admitted in the dermatology department with a rapid progressing of erythematous, maculopapular rash all over the body since a week after taking methazolamide with topical timolol maleate and pilocarpine nitrate for her glaucoma. Methazolamide was started as 50 mg tablet twice a day for ten days. 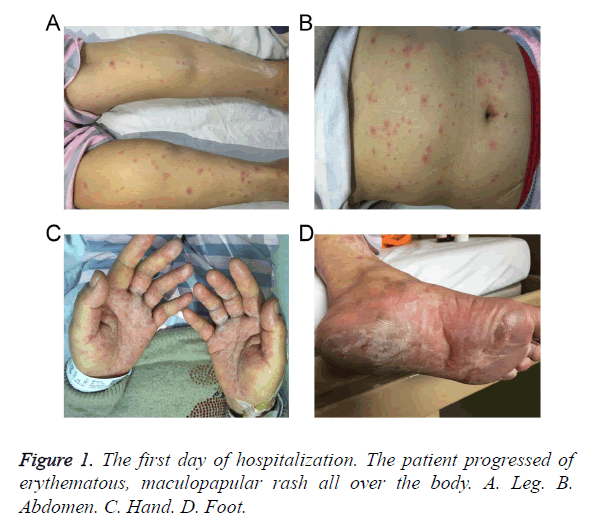 Five days later, she presented to us with a severe maculopapular rash with targetoid lesions all over the body and bullous lesions around her palms and soles (Figure 1). Physical examination on admission also revealed swollen eyelids, moderate hyperemia and purulent discharge in her eyes, and erosions over lips. Multiple oral ulcers were seen. There was also involvement of skin over genital regions. There was no previous history of drug allergy with same drug or others. Figure 1. The first day of hospitalization. The patient progressed of erythematous, maculopapular rash all over the body. A. Leg. B. Abdomen. C. Hand. D. Foot. The body surface area involvement of the patient at the time of the presentation was approximately 30%. Over the next a week, she developed severe bullous lesions and extensive exfoliation involving more than 80% of the body surface (Figure 2). A diagnosis of methazolamide-induced TEN was made on the basis of temporal relationships, positive drug history, associated clinical symptoms and signs, and positive Nikolsky’s sign. Serum transaminases and other haematological investigations were deranged. There were hypoproteinemia, hyponatraemia, hypochloraemia and hypokalaemia. Serological tests for HIV, HBV, HCV and TPHA were negative. The allele HLA-B*5901 was detected positively in this patient using the PCR of Sequence-Based Tying (PCR-SBT) method. Figure 2. One week of hospitalization. The mucosa lesions involved even the whole body, accompanying with obvious exudation and the extensive erosion and denudation. A. Foot. B. Chest and abdomen. C. Arm. D. Back. According to the blood test and the laboratory examinations results, among the blister fluid mono-nuclear cells, 55% had the granularity and size of lymphocytes in this case. The most dominant phenotype for the above lymphocytes were CD8+, CD3+, and most of the cells co-expressed the CLA and HLA-DR. Meanwhile, the immunological examinations were also performed to find the immunological disease or auto-immune diseases, and we have not found the associated immune diseases in this patient. The patient was administered on methylprednisolone intravenously 80 mg/d and supportive care, including fluid replacement with electrolyte and albumin solution (2.5% human serum albumin, 10 g/d) was also started. Subsequently, the patient’s skin rash progressively worsens and, on hospital day 8, it was progressed to TEN. Extensive exfoliation and a large amount of wound fluid on her trunk and both axillary lesions were seen. She was transferred to an intensive care ward with the room temperature 28°C to 30°C. Immunoglobulin intravenously was performed at a dosage of 0.4 g/kg daily for 5 days; albumin solution was increased to 20 g/d for 3 days and then changed to 10 g/d. The need of fluid replacement with electrolyte was calculated exactly every day by the amount of denuded skin and urine volume. The blisters were punctured and left in place, and wound fluid covered with Vaseline gauze. Total of 2% sodium bicarbonate solution was used to rinse for many times every day for a prevention of oral candidiasis and yangyin shengji power (which was composed of millet, wheat flour, bean products and the other side crops except for millet and wheat) to treat oral ulcers. Erosions of lips and eyes were treated by the topical application of chlortetracycin hydrochloride eye ointment and tobramycin and dexamethasone eye drops respectively. After about 20 days of hospitalization, skin eruptions of her trunk and upper limbs dried and crusted obviously while lesions of lower limbs still remained in serious conditions. The dosage of intravenous methylprednisolone was then gradually tapered off. 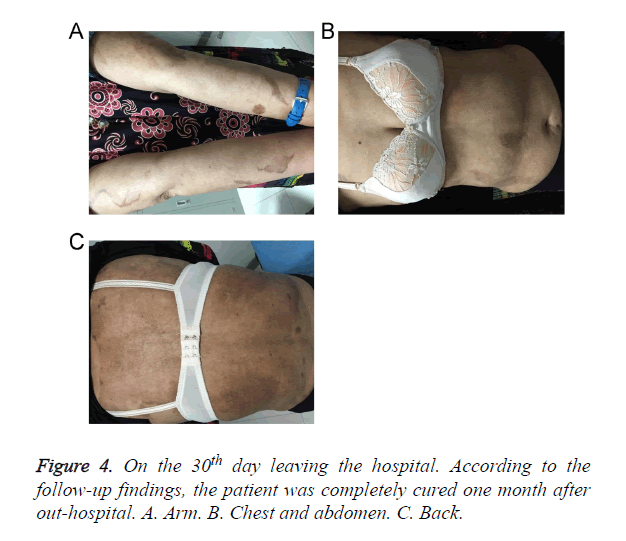 On the 28th day of hospitalization, the patient was discharged with erosions healed and epithelialized (Figure 3). According to the follow-up findings, the patient was completely cured one month after out-hospital (Figure 4). Figure 3. On the day of out-hospital. The kin eruptions of her trunk and upper limbs dried and crusted significantly, and the patient was discharged with erosions healed and epithelialized. A. Leg. B. Back. C. Chest and abdomen. Figure 4. On the 30th day leaving the hospital. According to the follow-up findings, the patient was completely cured one month after out-hospital. A. Arm. B. Chest and abdomen. C. Back. Stevens-Johnson syndrome (SJS) and Toxic Epidermal Necrolysis (TEN) are Severe Cutaneous Adverse Reaction (SCARs) characterized by extensive necrosis and detachment of full-thickness epidermis and erosions of the skin and mucous membranes . Although these adverse reactions are rare, they are life-threatening conditions with high morbidity and mortality. Currently, drugs are the etiologic factor in the majority of SJS/TEN cases . Genetic susceptibility has been shown to have a pivotal role in the occurrence of some SCARs. Methazolamide is a sulfonamide derivative used as a carbonic anhydrase inhibitor to reduce intraocular pressure elevations associated with glaucoma and other ocular disorders. Thus far, case reports on methazolamide-induced SJS/TEN have primarily been limited to patients of Japanese and Korean descent. A correlation between HLA-B59 and methazolamide-induced SJS/TEN was first suggested by Shirato . Later, Kim et al. further noted that HLA-B*5901, which is specific to the Japanese or Korean population is correlated strongly with methazolamide-induced SJS/TEN . Xu et al. reported the first case of methazolamide-induced TEN of a Chinese Han female with positive HLA-B*5901 typing last year. B59 is an HLA-B serotype and has been observed mainly in Asians. Its frequency was estimated to be only 1.8% in Japanese, 2.1% in Koreans and 0.35% in Han Chinese [12,14,15]. Actually, the association between the HLA haplotype and drug eruptions is different for the different races; therefore, the different drug eruptions may occurrence for the population in the different races [16-18]. Until the pathogenesis of SJS/TEN is completely solved, treatment is based on nonspecific and symptomatic means. The latter are most important for patients with large amount of skin detachment requiring intensive care in specialized units. Furthermore, sequelae, such as strictures of mucous membranes and symblepharon, which may lead to long-lasting impairment, should be prevented. In recent years glucocorticosteroids and intravenous immunoglobulin (IVIg) have been proposed in the early acute stage of SJS/TEN. Early steroid pulse therapy may help to prevent ocular complication and IVIg block the Fas-mediated necrosis of keratinocytes. This report is the second one for investigating the methazolamide-induced TEN of a female patient with HLA-B5901 positively expressed in China. This report was also the forth one that reported the relationship between the methazolamide-induced TEN and the HLA-B5901 serotype till now. The positively expressed HLA-B5901 serotype could act as the prognostic biomarkers for the potential occurrence of TEN in Chinese Han population. Meanwhile, the early discover and stop using the suspected drug is also an important method to improve the prognosis of TEN. Stevens AM, Johnson FC. A new eruptive for fever associated with stomatitis and ophthalmia. Am J Dis Child 1922; 24: 526-533. Bastuji-Garin S, Rzany B, Stem RS, Shear NH, Naldi L, Roujeau JC. Clinical classification of cases of toxic epidermal necrolysis, Sevens-Johnson syndrome, and erythema multiforme. Arch Dermatol 1993; 129: 92-96. Chung WH, Hung SI. Genetic markers and danger signals in Stevens-Johnson syndrome and toxic epidermal necrolysis. Allergol Int 2010; 59: 325-332. Frech LE. Toxic epidermal necrolysis and Stevens Johnson syndrome: our current understanding. Allergol Int 2006; 55: 9-16. Yamane Y, Aihara M, Ikezawa Z. Analysis of Stevens-Johnson syndrome and toxic epidermal necrolysis in Japan from 2000 to 2006. Allergol Int 2007; 56: 419-425. Karadaun SH, Jonkman MF. Dexamethasone pulse therapy for Stevens Johnson syndrome/toxic epidermal necrolysis. Acta Derm Venereol 2007; 144: 144-148. French J, Trent J, Kerdel FA. Use of intravenous immunoglobulin in toxic epidermal necrolysis and stevens-Johnson syndrome: our current understanding. Int Immunopharmacol 2006; 6: 543-549. Bamichas G, Natse T, Christidou F, Stangou M, Karagianni A. Plasma exchange in patients with toxic epidermal necrolysis. Ther Apher 2002; 6: 225-228. Roongpisuthipong W, Prompongsa S, Klangjareonchai T. Retrospective analysis of corticosteroid treatment in Stevens-Johnson syndrome and/or toxic epidermal necrolysis over a period of 10 years in Vajira hospital, Navamindradhiraj university, Bangkok. Dermatol Res Pract 2014; 2014: 237821. Bastuji-Garin S, Rzany B, Stern RS. A clinical classification of cases of toxic epidermal necrolysis, Stevens Johnson Syndrome and erythema multiforme. Arch Dermatol 1993, 129: 92-96. Mockenhaupt M. The current understanding of Stevens-Johnson syndrome and toxic epidermal necrolysis. Expert Rev Clin Immunol 2011; 7: 803-813. Shirato S, Kagaya F, Suzuki Y. Stevens-Johnson syndrome induced by methazolamide treatment. Arch Ophthalmol 1997; 115: 550-553. Kim SH, Kim M, Lee KW, Kim SH, Kang HR, Park HW, Jee YK. HLA-B*5901 is strongly associated with methazolamide-induced Stevens-Johnson syndrome/toxic epidermal necrolysis. Pharmacogenomics 2010; 11: 879-884. Xu Y, Wu M, Sheng F, Sun Q. Methazolamide-induced toxic epidermal necrolysis in a Chinese woman with HLA-B5901. Indian J Ophthalmol 2015; 63: 623-624. Yang F, Xuan J, Chen J, Zhong H, Luo H, Zhou P, Sun X, He L, Chen S, Cao Z, Luo X, Xing Q. HLA-B*59:01: a marker for Stevens-Johnson syndrome/toxic epidermal necrolysis caused by methazolamide in Han Chinese. Pharmacogenomics J 2015; 16: 83-87. Yan S, Chen SA, Zhang W, Yang F, Yang Y, Zhu Q, Zhu H, Sun X, Jiang M, Su Y, Zhang L, Xing Q, Luo X. HLA-A-02 alleles are associated with letanus antitoxin-induced exanthematous drug eruptions in Chinese patients. Pharmacogenet Genomics 2016; 26: 538-546. Fricke-Galindo I, Martinez-Juarez IE, Monroy-Jaramillo N, Jung-Cook H, Falfan-Valencia R, Ortega-Vazquez A, Alonso-Vilatela ME, Lopez-Lopez M. HLA-A-02 haplotype associated with lamotrigine-induced maculopapular exanthema in Mexican Mestizo patients. Pharmacogenomics 2014; 15: 1881-1891. Ikeda H, Takahashi Y, Yamazaki E, Fujiwara T, Kaniwa N, Saito Y, Aihara M, Kashiwagi M, Muramatsu M. HLA class I markers in Japanese patients with carbamazepine-induced cutaneous adverse reactions. Epilepsia 2010; 51: 297-300.